I went into motherhood having a ‘we’ll see how it goes’ attitude to just about every part of being a mum, including breastfeeding, as I had seen many very strong women shocked and surprised by the reality of motherhood and their ideals completely shattered by the reality of the individuality of their baby needs. Luckily for me, my daughter came out knowing exactly what to do and taught me how to feed her. We had an amazing 13ish months breastfeeding. I loved it and found it to be so convenient, cheap and just plain nice. Second Pregnancy: At the 19 week scan during my second pregnancy we found out baby had a cleft lip, and went on to discover this most likely involved the palate as well. I was so upset when I was told that this would make breastfeeding an impossibility. 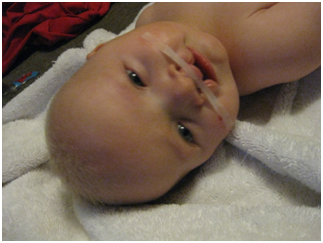 This was really the only thing that upset me about having a baby with a cleft. Luckily for me I had an amazing midwife who immediately referred me to a lactation consultant who then discussed expressing as a real possibility. My LC was a superstar, who supplied me with a lot of syringes to harvest colostrum and gave me so much practical information about what it would involve. After Jarvis was born we had a slightly extended stay in hospital to ensure that he could use the specialised bottle and my milk doing what it should, but I am so proud to say that he was exclusively breastfed for around 13 months. This took a lot of work and heaps of support from my husband, as it meant I was on a chair for between 6-8 hrs a day at the start to 3 – 4 hours nearer the end to keep my supply going. During this time I used a couple of pumps – a hospital grade pump from my LC, a reasonably well known brand pump that was for high usage. I also used a few different pumps while in hospital for my son’s surgeries. All of these were great but very expensive. 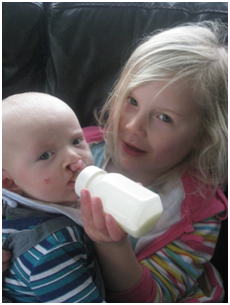 Third Pregnancy: Then in 2012 I found out I was having another baby (a typical surprise number 3). At the 18 week scan our sonographer identified her second only cleft, the other one was our first son. (Having had a cleft baby meant we had about a 4% chance of having another). She was lovely, and was so sympathetic, then checked carefully for any other midline problems, the first of many scans of this kind. 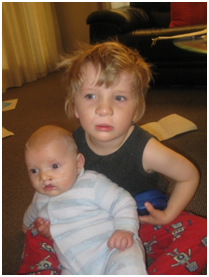 There is no denying that we were a bit upset about having another baby with a cleft. My husband, because he wanted me to have my much wished for local hospital birth and breastfeeding experience, and both of us because we were no longer naive about what a tough year that first year is, with so many appointments, and two surgeries, adding to this now having 2 preschool children to work around, one with extra speech needs, eczema and allergies. At the same time we knew (like all second/third etc time parents) that this year just zooms and we were so blessed to have a healthy, and strong third baby. Asher (meaning joyful blessing) caused lots of drama, mostly because he was so active and wouldn’t settle into a good position until very late in the pregnancy, even being transverse near the end, but it worked out that, after a very long pregnancy, he knew what he was doing and gave me a birth that I will treasure as an experience you usually only read about, calm, peaceful and empowering. We were excited to met our little person and also to check out his face, which even puzzled experts during scans during the extreme nature of both his lip and palate. Again, as with our first son, as soon as we met him love overwhelmed us and his face, so unique, was not odd but just him. We certainly looked forward to seeing his magical cleft grin, which I cannot describe, but if you ever see a real life one you will understand! My Breast Pump I knew I wanted to give this baby my milk as well, but didn’t know if I would manage given all the extra demands on my time. Also my previous pump had done its dash and would not have the pull to maintain a decent supply. We are a very middle to low income family and a new pump for my requirements would put a big dent in our savings. Fortunately a friend of mine put a call out on a Facebook site, telling my story and asking for advice on how to access funding. The kindness shown on this site was incredible, and through this, Leah told me about Unimom breast pumps and how they were up to the job and so affordable. To tell you the truth I was quite cynical, but at the price I thought, ‘Oh well, I could buy a couple or three over the time and it will be the same price as a more well known brand pump’. My Unimom Forte: Initially, as last time, I used a pump loaned from an LC, and I also had a pump loaned from a friend of a friend, which established my supply... Then I started using the Forte. My supply was around 2 litres a day and I was able to donate a substantial amount of milk to others, this helped keep my freezer supply fresh. I pumped for 16 months and probably about 12 – 13 of those months I was using the Unimom Forte breast pump. This is pumping around 4 – 6 hours in a 24 hour period, depending on what I was doing with my supply. I found the machine fantastic. It was as good as or better than all of the very expensive well known brand machines, and believe me I have tried nearly all of them over my time. It is quiet and it looks sweet and strangely enough I found liking your pump helps with supply. I was probably a bit paranoid about losing supply the second time round, hence my over supply, but I knew as the baby gets older they get busier and it is harder to find the time. I am now so glad I did because my 19 month old is still getting breastmilk from my freezer stash, such a satisfying feeling. I found my journey with expressing a challenging one, and it involved a lot of logistical juggling. My portable inverter for plugging the pump into the car (initially a buy for the emergency kit) , hands-free bra, and nursing cover, for pumping anywhere and in any company were a must! My husband deserves a medal – as you can imagine, with that much time spent expressing I had less time for housework. Despite all of the challenges expressing involves I would do it again. We were told to expect our sons to have endless ear infections, but I think they had only had 1 between them, that alone is enough to convince me that it was worth it, but the knowledge that they got the food they were designed to have is an incredible feeling. My recomendation:I would and do recommend the Unimom Forte breast pump to anyone. My experience with it was fantastic. The only time I needed to contact Express the Best again (apart from buying some nice teas/biscuits etc) was to get the valves that become less efficient over time, but these are so affordable and again much more affordable than the valves in more expensive pumps. I feel that if anyone would wear a pump out it would be me, and this pump did what it needed to for a very long time. 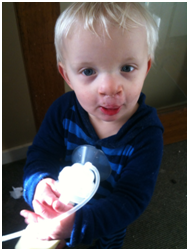 I am extremely grateful to my little pump that helped me feed my son the milk designed for him.